For fourteen years, Jacques Barth worked at the NASA Jet Propulsion Laboratory and one of the results was a patented invention. You can read all about it in another news item on this website. In early December 2018, NASA published its list of the ultimate Top Ten Inventions and we are proud to note that Jacques Barth’s invention was number 8 on the list. Technology and medicine forged a bond in 1986 when a group of dedicated NASA scientists, University of Southern California (USC) medical professors, and a Dutch cardiologist joined forces to prevent heart attacks, using ultrasound images of astronauts’ blood-flow patterns and the supercomputer depended upon to orchestrate the “Star Wars” Strategic Defense Initiative. In the mid-1980s, a well-respected USC medical professor named Dr. David Blankenhorn was captivated by a New England Journal of Medicine article penned by noted preventive cardiologist Dr. Jacques Barth. Prior to reading this article, Blankenhorn had a global vision that the future of cardiology was prevention, especially with regard to diabetes, obesity, heredity, and other conditions that lead to serious cardiac events. Both Blankenhorn and Barth wanted to learn whether reversal or regression of cardiac diseases was possible. In the Netherlands, Barth directed a clinical trial called the Leiden Intervention Trial for patients who were deemed too advanced in their disease to be considered for cardiac bypass surgery. The patients being studied underwent lifestyle management modifications, including diet, exercise, and smoking cessation, to determine if the progression of cardiac atherosclerosis (clogging and hardening of the arteries) could be stopped or reversed. The outcome of the trial was considered revolutionary for the world of cardiology, as the majority of patients who complied with the healthy lifestyle changes actually stopped or reversed the progression of the disease. 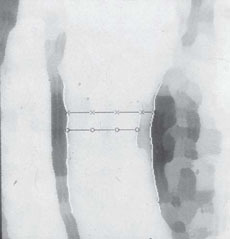 Although the quality of ultrasound imaging has improved dramatically since this grainy 1986 image of a 36-year-old astronaut—taken by Dr. Jacques Barth using a Jet Propulsion Laboratory computer considered superior at the time—it was clear that early signs of atherosclerosis were already present. Up until this time, the system for measuring cardiac profiles was angiography, known to be somewhat of a risky procedure. It was evident to Blankenhorn that a noninvasive system needed to be developed whereby patients could be monitored on a regular basis without risk. Because Barth had been conducting ultrasound of the common carotid artery for quite some time, the idea emerged to use this noninvasive technique as a quantitative system for assessing cardiac health. In the mid-1980s, quantified medicine, or the concept of calculating exact numbers from digital imaging without settling for “eyeball” estimations, was seen as the wave of the future. Blankenhorn suspected that it would take a really big computer to develop a new, noninvasive system, as well as some scientific and medical “camaraderie.” Knowing that NASA’s Jet Propulsion Laboratory (JPL) was one of the only entities in the world to house a computer of the required magnitude and possess the expertise to convert analog images to digital moving images, Blankenhorn recommended that Barth submit a grant application to the National Research Council, in Washington, DC, for development of a cardiac system to monitor astronauts. under zero gravity conditions. These astronauts required an increased amount of constant blood pumping to have sufficient blood flow, demonstrating that “less muscular”astronauts had an advantage. The National Research Council awarded the grant to Barth, who then moved to Pasadena, California, to work with JPL experts and the large computer, as well as members from the USC medical staff. He and the JPL/USC team were able to conduct ultrasound on the astronauts in order to determine the level of elasticity of their blood vessels. The JPL supercomputer, already being utilized by the U.S. Department of Defense to control “Star Wars” technologies, was the only system in the world that could digitally capture the ultrasound images for this effort. By monitoring whether there was sufficient blood flow to the brain while astronauts acted in simulated space, the computer could indicate whether the oscillations of the targeted blood vessels resulted in a change of flow. One of the first signs of atherosclerosis is diminished elasticity, which adversely affects blood flow. From this condition, diagnosis and tracking can show whether an astronaut had an existing cardiac disease. According to Barth and company, the “Star Wars” computer technology was now the first line of defense for preventing heart attacks. Though blood flow was an important scientific study for astronauts, the practical applications for atherosclerosis became monumental. With assistance from the JPL scientists, the system for capturing images of blood flow from ultrasound images became more streamlined, allowing for the development of what the technique is today. For example, blood flow images can now be captured in 1/10 of a second, compared to a whole day when the project first started in the 1980s. 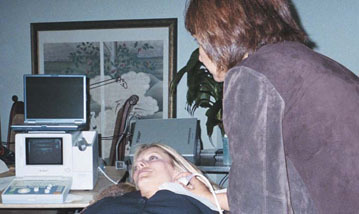 Ultrasound procedure of the common carotid artery, performed in a physician’s office. This noninvasive, painless procedure takes approximately 10 to 15 minutes and the patient does not need to disrobe. the CardioZone system is at the top of the ultrasound technology currently available for the management of cardiac lifestyles. The U.S. Food and Drug Administration-approved method is a nonradiation, nonchemical, safe, and painless scan of the carotid arteries that is processed and computer-analyzed through proprietary software technology. Scans take from 10 to 15 minutes to perform and are analyzed by Barth’s laboratory. According to the provider of CardioZone, IMTHeartScan, Inc., the cardiac-testing technology is the only noninvasive procedure available for identifying fatty deposits called soft plaques. These deposits are held in place by a thin, fibrous cover susceptible to ruptures. The deposits may narrow the artery, but more importantly may trigger massive clots upon rupture, possibly filling up the entire artery and causing life-threatening heart attacks. CardioZone is also more cost-effective than other diagnostic tests intended to detect atherosclerosis. At approximately $300 to $500, the procedure is far less expensive than either magnetic resonance imaging or electron beam computed tomography (whole body) scans, which can cost upwards of $2,000 and in many instances are not covered by insurance (CardioZone tests are reimbursable based on medical necessity). One of the rewarding aspects of CardioZone is the opportunity to test asymptomatic individuals who do not know they have cardiovascular risk factors. Upon learning their “score,” there is a “phenomenon of empowerment” for these individuals that tends to turn their lifestyles around in a positive manner. 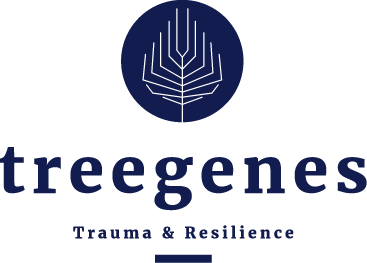 By looking at the disease as a whole, not just the risk factors, individuals can see through to a way of preventing progression of the conditions. Barth and the CardioZone technology have saved the lives of countless individuals who did not experience symptoms of cardiac disease but were likely to suffer a serious event if not treated. If not for the collaboration and determination of NASA JPL scientists and a band of visionary preventive medicine physicians, the lives of many would not have been saved. CardioZone™ is a trademark of IMTHeartScan, Inc.